Oled stands for Organic Light Emitting Diode. Oled, unlike LED and Qled, is a completely new display technology. The panel is actually made of millions of LEDs and the addition of the 'O' stands for 'Organic'. This means that the LEDs themselves can generate light to display the image and do not need a backlight as Plasma, LED and QLED. Oled is not Led or Qled. The pixels of an Oled monitor consist of organic materials that provide light when electricity flows through them. Because each pixel can be turned on and off separately and gives light, there is no need for backlighting (Back-Light). But when the pixel is off, it is really black. With a Led and a Qled monitor the pixel cannot be switched off. Because an Led/Qled always needs backlight (LED lighting), the pixel does not turn black but gray due to the backlight. This makes it impossible for a Led or Qled monitor to display pure black. In addition, the Oled technology has a number of advantages over LED / Qled. 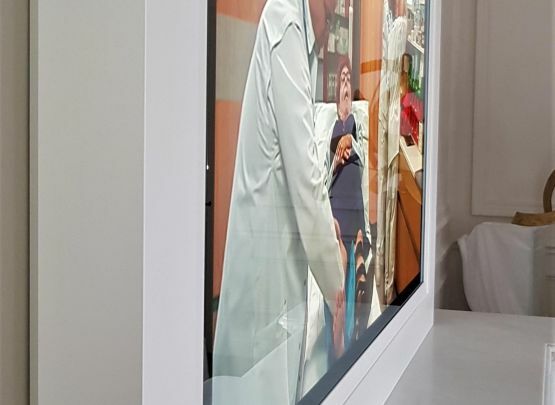 Compared to an Led or Qled TV, the viewing angles are much greater due to the Nano Cell technology. Moreover, the brightness and contrast of an Oled is much higher than we are used to from Qled and Led TVs. The energy consumption of an Oled, on the other hand, is much lower. The OLED monitors have far more advantages compared to Led and Qled. Below we show why we have chosen Oled. α9 (Alpha9) Intelligent Processor is optimized for LG OLED TV. Brightness with beautiful details, vibrant colors and more depth on every image with α9 Intelligent Processor. α9 (Alpha9) Intelligent Processor is optimized for LG OLED TV. Brightness with beautiful details, vibrant colors and more depth on every image with α9 Intelligent Processor. We have doubled the amount of noise reduction steps compared to dual-core processors, which significantly reduces the noise and improves the image in the process. The advanced algorithm in the α9 processor improves the clarity of the images by removing artifacts and creating clean, sharp 4K photos. The object depth enhancer separates exactly the main object of the background images and analyzes textures and edges. By detecting the edge of the main image, Alpha 9 can improve the sharpness of those edges, create depth and reveal hidden details of what you're watching. The internal Color Look Up Table (CLUT) is significantly enlarged, so there is more depth and accuracy with colorful content. With more processing power under the hood, hi-octane content has never looked so good. With HFR you get clear fluid motion with less vibration and blur even at high frame rates. The 4K Cinema HDR from LG brings the filmmakers' vision through support for most HDR formats. Enjoy a real cinema experience with Dolby Vision ™ at home and Advanced HDR from Technicolor, as well as HDR10 Pro and HLG Pro. The OLED monitors have far more advantages compared to Led and Qled. Below we show why we have chosen Oled. A very exclusive glass and mirror collection (available nowhere else). The above mentioned ultra thin Oled will be delivered with an extension cable and setup box or soundbar. Perfect design, Slim and light! With just two layers of Oled this Digital Display is unbelievely light-weight and thin. Or you (we) can customize this product as a furniture item. The In Glass Oled monitor is an Oled that shows images on both sides (Dual View). 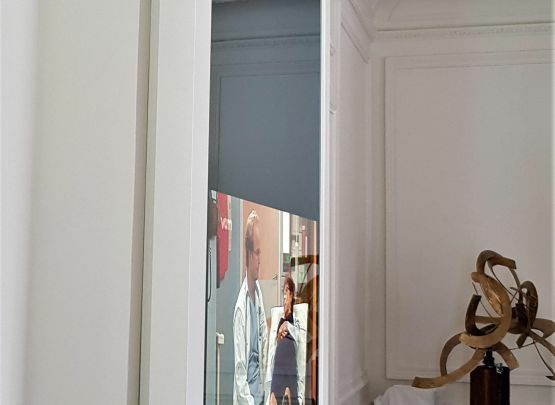 This Innovative display gives the impression that the screen is floating in air and that the projection from both sides are comming directly from the glass. We can exchange these glass surfaces for Ultra thin mirrors. This Glass Oled is available with a ceiling mount or with floor stand. 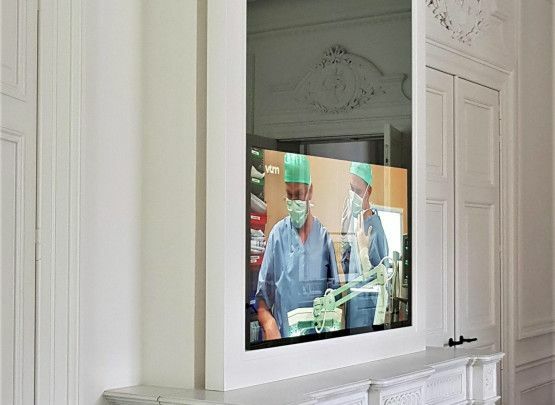 The Video Wall Oled Mirror TV is available with different Mirrors and Glass in different RAL colours. Installation in Portrait and Landcape is possible. Oled Mirror TV comes with a 2-year manufacturer's warranty on the consumer and semi professional Oled monitors. We provide a 3-year manufacturer's warranty on the professional monitors. At Oled Mirror TV we only offer high-quality products. Brands such as Bang & Olufsen, Loewe and Sony also purchase the OLED monitors from LG Electronics. This is a well-considered choice. 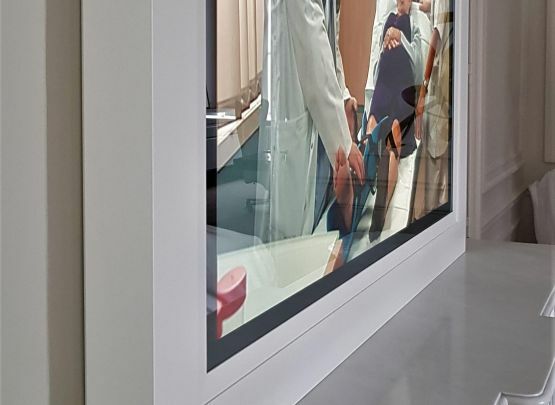 Because we also aim for quality, we provide a 3 -year guarantee on the professional Oled monitors of LG Electronics. We provide a 2-year guarantee on semi professional and consumer monitors. This guarantee starts from the purchase date. 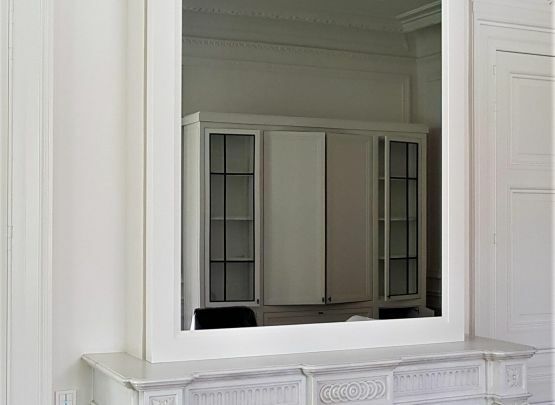 The mirrors and glass surfaces are mounted in such a way that they can be easily disassembled. This makes it easy for the technical service to access the monitor for service.